I made these classroom Valentine printables for my children to give out and figured you might also need them. Even if you are all set for this year, be sure to save these for next year! I'm a recovering procrastinator. And by that I mean, I'm still working on it. There are plenty of reasons why I may procrastinate, but one of them is underestimating my time. Take Valentine's Day for instance. I knew my kids would have classroom Valentine's Day parties coming up. Their teachers sent home a list of names weeks ago, but it felt like we had plenty of time to get our classroom valentine cards together. 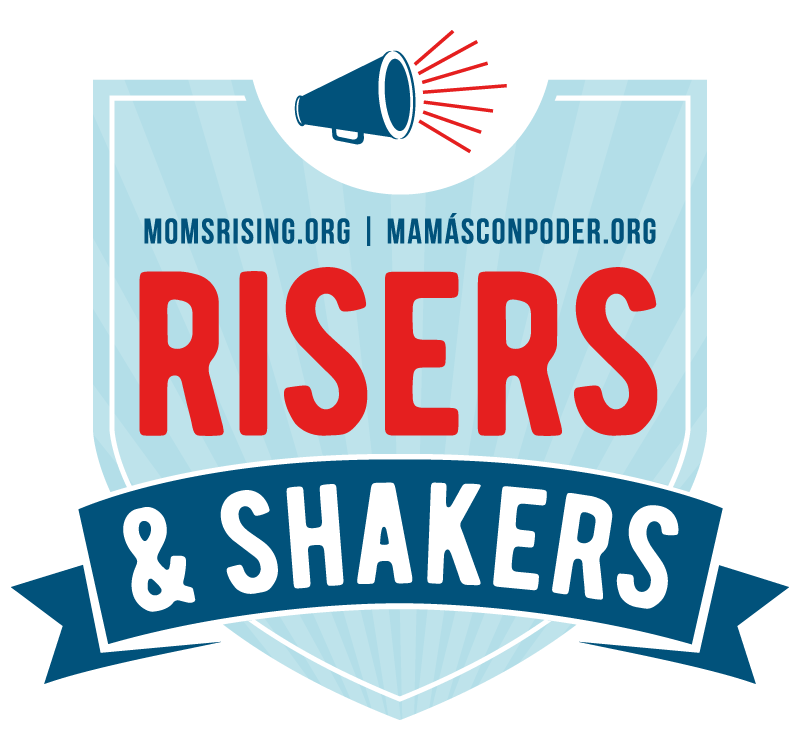 This post contains affiliate links and we may earn a commission if you make a purchase. My plan from the beginning was to create printable valentines for my children to hand out at school. While there are plenty of valentine cards I could buy at the store, I like being able to print however many I need. I wanted cute, simple, and punny valentine cards. We even bought the valentine pencils and mini bubbles a week before I made the printable cards. 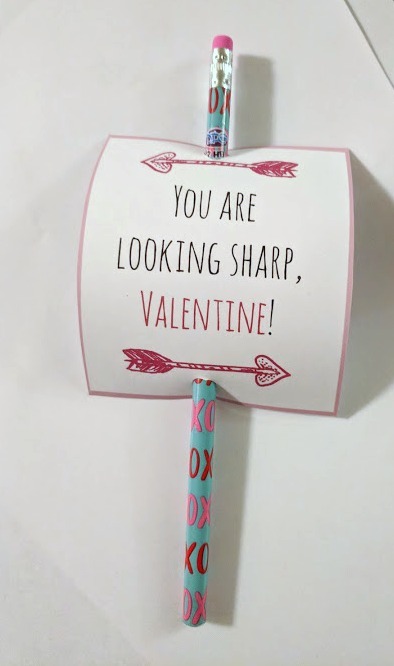 I figured the Valentine's Day pencil puns would be perfect for my daughter's first grade class, especially since they are working so much on writing. And bubbles, well, what kid doesn't have fun blowing bubbles? I knew those would be a hit in my son's preschool class. Don't you just love clever puns? I'm not quite as punny as my best friend, but I definitely appreciate a good pun. 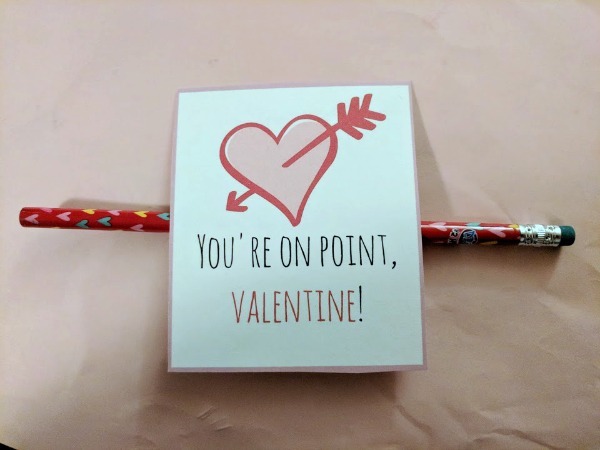 When I told my daughter my idea for these pencil valentines, she loved them. You are looking sharp, Valentine! You are the WRITE one for me, Valentine! To put these together, you'll need white card stock and pencils. Oh and don't forget to click here and download our Valentine Card pencil printable (for personal use only). You can use any kind of pencil you want, but Valentine themed pencils are a nice touch. My daughter wrote who they were to and from on the back. You can assemble these a few different ways. We taped pencils to the back of several of them and we also hole punched some in order to slide the card onto the pencil. Pro Tips: Write in the middle of the card so you don't hole punch any of the writing. Also, a regular sized hole punch makes a hole that is too small for a regular pencil to fit through. You would need a larger sized hole punch or punch a couple times to widen the hole. The bubble valentine printables are smaller than the pencil valentines and square. Valentine, I'm blown away by you! Valentine, I'm bubbling with excitement! To put these together, you'll need white card stock and bubbles. Click here to download our printable bubble valentine cards. These are for personal use only. You can use these with any size of bubbles. I chose mini bubble bottles since they were going to my son's preschool classroom. He practiced writing his name on the back of them. I hole punched the corner and used ribbon to tie them around the bubbles. 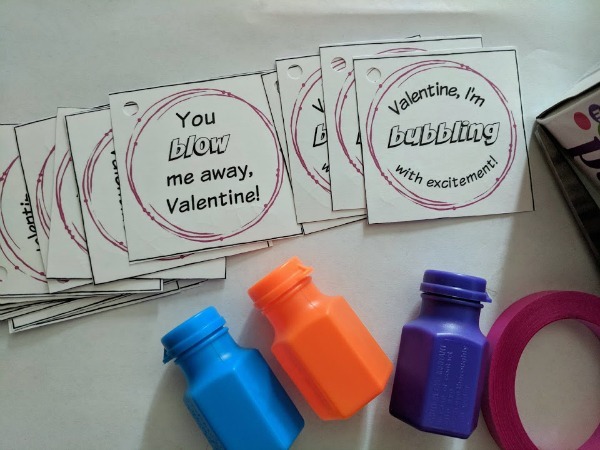 Depending on the size of your bubble bottles, you could tape them to the back of the valentine card or tape the valentine onto the bottle. 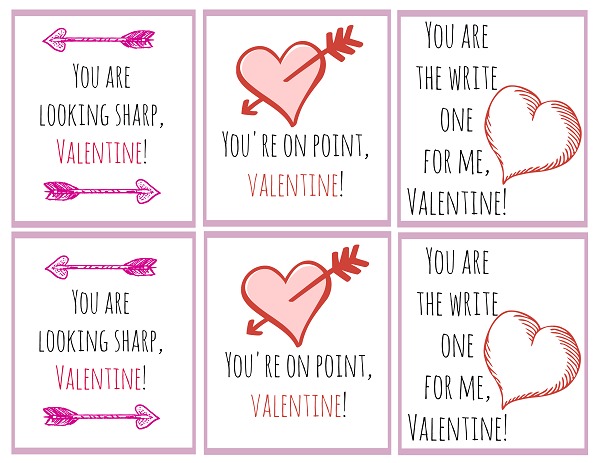 We hope you enjoy these options for printable classroom valentines! You can quickly get these printed out and put together if you need last minute valentines for your child's Valentine's Day school party.